With your skillet, you’ll make hundreds of different dinners and desserts. 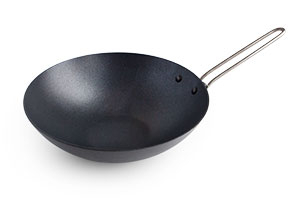 The skillet that works best is a non-stick skillet that is rounded and deep like a wok. It also needs to be lightweight and easy to handle. After a year of back and forth with a pan manufacturer, I’m pleased to offer the Perfect BakeOver Skillet with a high-tech, high-heat coating and a collapsible handle. How handy is that? The skillet I designed is 9” in diameter and makes four servings. Better yet, when it comes time to wash your skillet, the surface makes clean-up a snap. 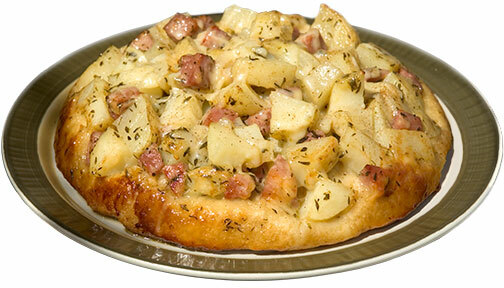 What could be easier than only one skillet to wash and think about after having served a main-course meal that included a complementary, fresh-from-the-oven, topping of bread? Next, you’ll pick from my BakeOver "tops" or "lids." Get some of my All-Purpose Budget Mix® (Original or Gluten Free) or choose a bread or dessert mix from my Budget Mix® Baking Mixes to match your choice of vegetables or your selection of fruit. When you use my prepared foods to top your BakeOver, you’ve essentially hired me to round up all the little bits of this and little bits of that and turn it into a meal. Selecting fresh vegetables and fruit. If you eat dairy or meat, you can add grated or cubed cheese, pre-cooked meat, tofu, or any boneless fish to the vegetables. If you use cheese, grate and add to the vegetables after you sauté them. To the fruit, you can add a layer of cream cheese. Pick your favorites and be creative, because they all work. Chop or slice the vegetables or fruit that you want into bite-sized pieces (they’re only going to be in the oven for 20 minutes), add seasonings to taste, and sauté them for 3–5 minutes in butter or oil in your skillet over medium heat. Then place one of my mixes or “lids” on top. After your skillet is in the oven FOR 20 minutes at 425°, you’ll flip the contents upside down onto a plate and serve! That’s all you do to make the BakeOver. There are no limits to what you can create. You can use up the old carrots in your refrigerator along with an onion, or you can chop up bell peppers and add a layer of cooked black beans, or cabbage and kale, or cubed tofu, celery or potatoes with herbs and squash, or garlic and mushrooms, or just mushrooms or just onions if that’s all you have. Then just top it with one of my Budget Mix® Baking Mixes. For dessert, you can slice up some apples or thaw some frozen peach slices, drain them and add a few raspberries, strawberries, and cranberries, or add some raisins, cinnamon, figs, coconut, maple syrup, honey, almonds or walnuts and then top them with one of my dessert Budget Mix® Baking Mixes. You can mix and match and play with the combinations and have fun dreaming up different BakeOvers with your neighbors and friends. Last night I made a Mexican BakeOver. My son topped his with sour cream. My husband added salsa. This meal looked gorgeous, the flavor was perfect, it was ORGANIC ... and it was made from scratch, sort of. Don’t have the time for a rolling pin? Use your hands instead! 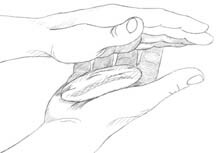 With your hands, divide the dough into 8 equal balls and flatten each ball between the palms of your hands. Place them on top of the sautéed vegetables or fruit.